We now know, project management KPIs are used as key measure to evaluate how effectively project is performing. In absence of KPIs it would be just a guesswork and arbitrary to determine project success or failure. Even one would not be able to specify how well or how much badly the project has performed. 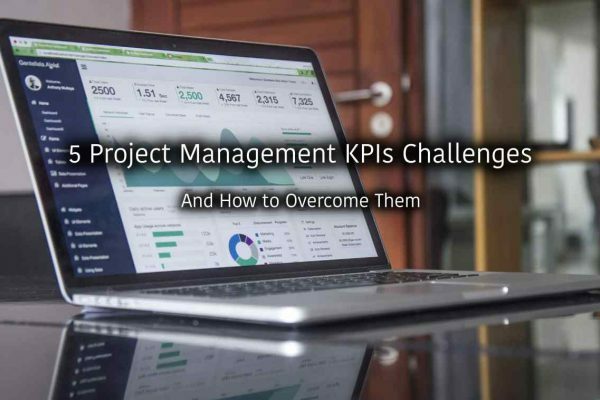 Yes, we are talking about project management KPIs or alternatively how effectively a project manager is able to manage the project, meaning KPIs for project manager. In the previous article we looked at the list of measures i.e KPIs for project team members and they can track their own performance using these KPIs. Project manager on the other hand needs to take micro as well as high-level view of a project. S/he needs to know exactly what is happening in the project in terms of tasks schedule, budget, estimated cost, actual cost, issues, risks, changes, resource allocation, utilisation, over-all progress, blocking elements, etc. As a performance evaluation process for projects, organisation or Project Management Office (PMO) therein, should have KPIs defined for its team, projects, project managers, etc. 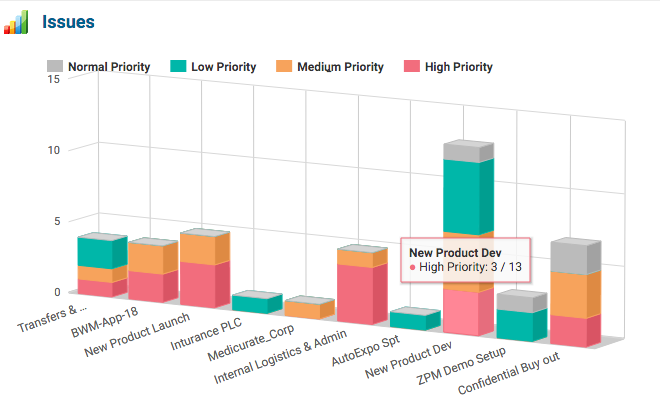 ZilicusPM has more than seventy (70+) KPIs for project managers to check health of the project(s) using dashboard and reports. Although ideally, all projects should be managed holistically, it is possible that team members and in some cases project managers are not well versed with holistic way of managing projects. It is understandable and true for accidental project managers. ZilicusPM has a way wherein one can turn off the project management modules for your company, if team is not well versed/comfortable with it. Of course, one can turn on these modules again as and when team knows about say project risks, project changes, project issues, stakeholder management, time tracking, cost management, expenses tracking, etc. Now let’s look at KPIs that project managers can track to assess progress of the projects they are managing. For some of these project KPIs, there is explanation and as well as snapshot is provided. Though not every organisation has mature project management processes in place but business managers are smart people and they have a clear way to assess whether project business is going in right direction or not. If your organisation has a way to specify what is acceptable slippage for a project, it becomes a project KPI. As mentioned earlier, some organisations can not let project lag more than 40% behind schedule, otherwise they feel the heat of penalty from their clients. In this case, internally, they might want to set project schedule KPI as 30%. So whenever any project lags behind schedule by 25%, it gets highlighted and corrective action can be taken. If your project has resource being used for their 30% of allocated time, that would be very difficult to justify in today’s competitive world. Especially if your projects have contractors and if you don’t assign them enough work, it adds to cost without significant benefit to the project. Resource utilisation is an important project KPIs not only from team’s perspective but also whether a project manager is able to play its role right. 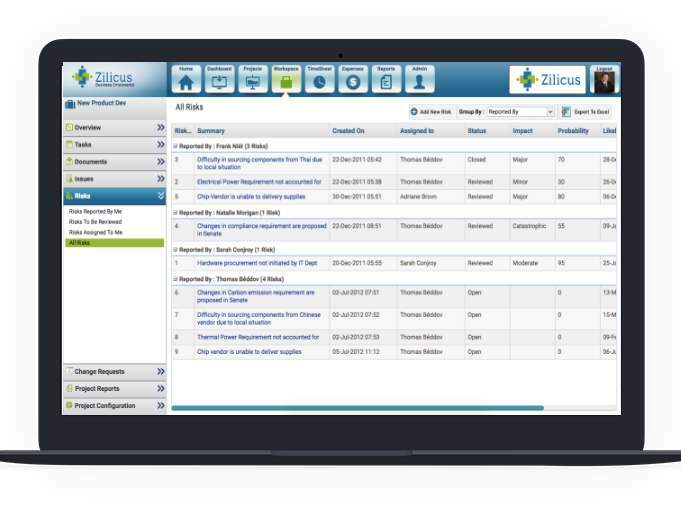 ZilicusPM let’s you clearly and transparently track resource utilisation KPIs. If you are a professional services organisation delivering projects for your clients, or if you are building a product, you will come across issues. Can you let project issues, incidents/bugs remain open: how many, for how much longer, by whom, of what priority? Answers to these questions give you another project management KPI about project Health – Issues. 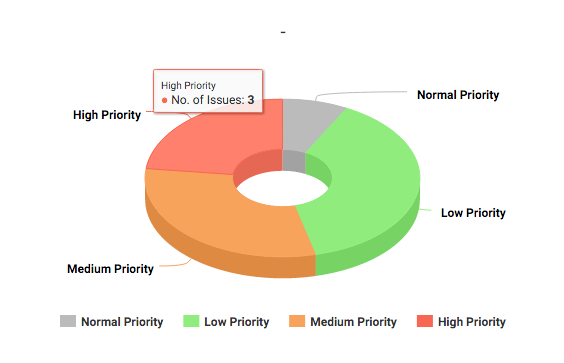 ZilicusPM multi-project dashboard clearly shows percentage of open issues for a given project a given point in time. If KPI says there can not be more than 50% of the issue remain open at any time, clearly what we see below is a crossing the limit set by KPI. Similarly if your organisation, department or projects deal with compliance, audit or anything related to hazardous stuff (Environment Health Safety); then risk management is must for you. It is not to say that risk management is not necessary in other kind of projects or business activities. In such cases, the performance evaluation i.e. the project KPI can be based on overall project Risk Exposure. You can track risk exposure on a regular basis and ensure that you are not crossing the line. How far a business can allow project progress to fall behind schedule? Different businesses have different measures, metrics e.g. usually in engineering procurements and construction (EPC) projects lag behind schedule in the early phases, so some clients understand it. In such cases slippage in early phases of such project my be acceptable say 20%. If project’s estimated cost is lesser than budget, it should raise warning sign. That’s a common sense. But how much lesser is acceptable is a project KPI thing. Project Budget vs Estimated Cost KPI gives absolute picture whether project estimated cost is overshooting budget or project manager would have revise budget and get the approval. 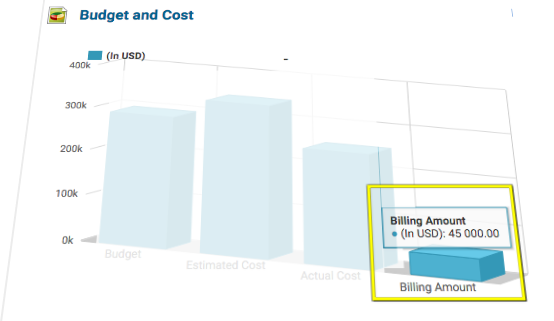 ZilicusPM has these comparison chart presented for project managers to easily and clearly understand the true picture of project budget-estimated cost. Project Estimated Cost vs Actual Cost KPI is clear indicator that informs project managers how far project ‘s actual financials are deviating from its planned one. It is easier to trace project cost deviation to estimated cost and understand which elements (project resources, tasks, issues, risks, changes) have contributed to change in the actual project cost from the estimated one. Project managers in professional services companies are very careful about resource utilisation; simply because every resource hour costs and can be billing to client. Maximum resource utilisation and maximum billability is how professional services strive to do the business. This KPI clearly helps project manager understand which all projects where resources are not utilised to desired percentage. Say an organisation has KPI of at least 78% resource utilisation across project, then project managers will find this KPI easier to know whether s/he is complying to organisation’s KPI. 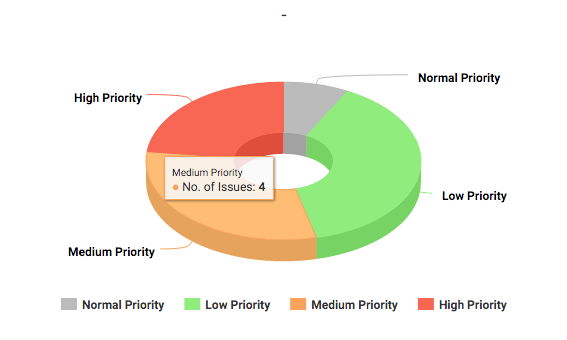 Project status KPIs is usually tracked as project progress indicator. However there are businesses who justifiably need to track how many projects are running, closed, completed, put on hold or cancelled. It also serves the department/organisation to know success ratio i.e. how far a given department, project manager, etc are able to successfully deliver projects. As simple as knowing number of projects in progress can help senior management to assess whether they can take up new projects or not, how many new projects can be taken up based on their experience and the number of ongoing projects. Once a project portfolio manager knows number of projects in Planning state, s/he can decide pool of project managers to allocate these projects to. Similarly, it helps many department heads to perform capacity planning. Once in a while, if your projects are put on hold for some reason, that might be okay. But if such thing keep repeating, then you will have to alert. Such tracking of On-Hold projects can be a KPI for certain kinds of industry or managers. 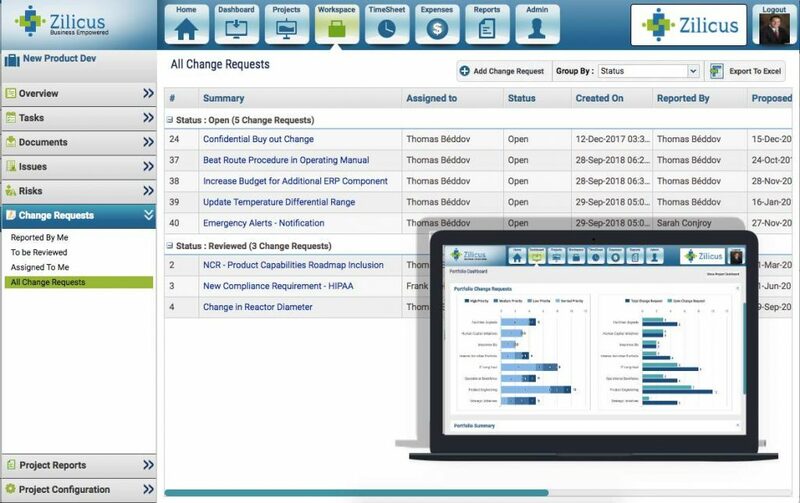 Just as mentioned above, this KPI enable project manager to know the number of projects irrespective of their status (completed, onhold, draft, in progress, etc) where s/he is a project owner. If a project manager would like to track number of projects where s/he is involved and belong to specific portfolio. 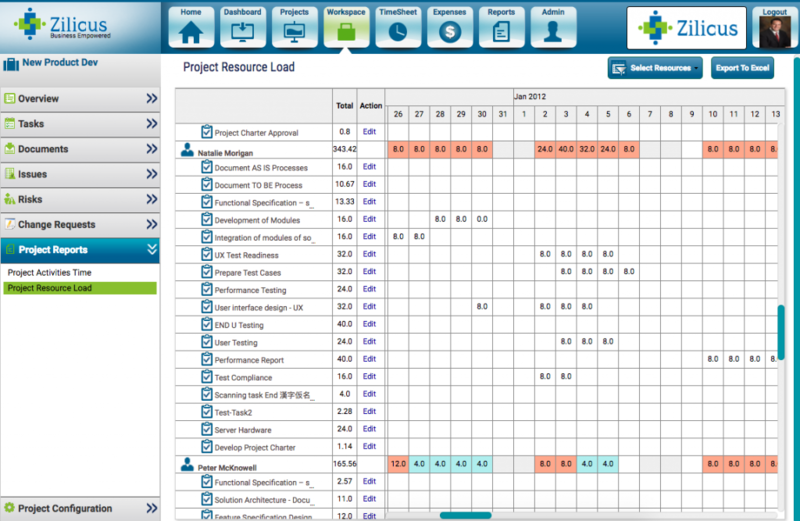 This KPI allows project managers to track number of projects by portfolios. How much of a project slippage is acceptable, when should be reported or escalated & brought to senior management’s attention. 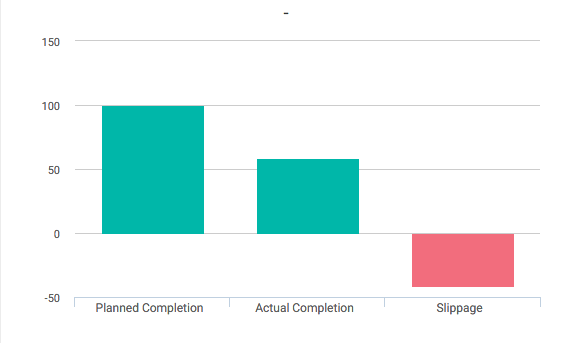 A project KPI for project slippage will set the guidance for project managers say – Upto 30% slippage in project schedule can be tolerated at any point in time. As mentioned earlier, if there are penalty for project delays, then organisations are very careful about project slippage. Such KPIs prove to be very effective in tracking and containing project delays. It may not reveal much information right at the beginning however if you follow one resource per task, you would know whether team is occupied enough or not; alternatively, looking at Gantt chart, you may know how many tasks should have been In Progress; and when you look at this KPI you can compare expected vs actual. Similar to above KPI if you follow one resource per task, you would know whether team is over occupied or unable to deliver if number of ‘Not started tasks’ are alarmingly high compoared to expected number of Not Started Tasks. 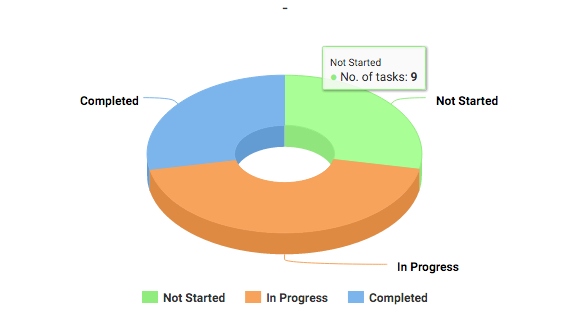 Similar to number of In Progress or Not Started tasks, one can check number of completed tasks in a project. Project manager or portfolio manager would want to check progress of a project schedule at a higher level of project plan. 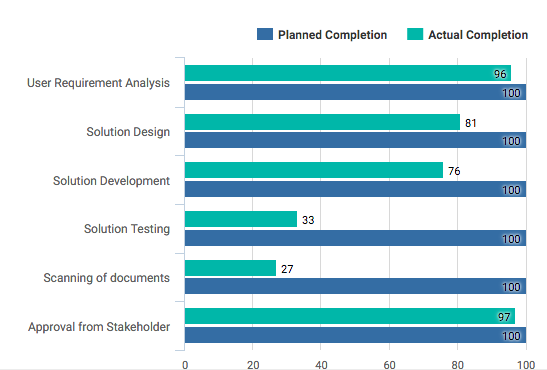 This project KPI allows project manager to compare planned completion vs actual completion at a given moment for higher level of project tasks. Similarly there are additional project KPIs that one can track to ensure project schedule is progressing the way organisation expects. More often than not, project executives want to know how many project milestones are achieved so far. It is a quick indicator to get high level understanding of project progress, without getting into detailed delivery schedule. In the similar manner project executives would also like to track how many project milestones are pending yet. It is a quick indicator to get high level understanding of project progress, without getting into detailed delivery schedule. Above all executives need to know totally, how many milestones are there across multiple projects in a given portfolio. As a project manager, you would never want to see any planned tasks to remain unassigned, even if the project schedule is pretty complex. Especially if the task is critical and remains unassigned because of oversight or for any other reason, can delay project schedule. 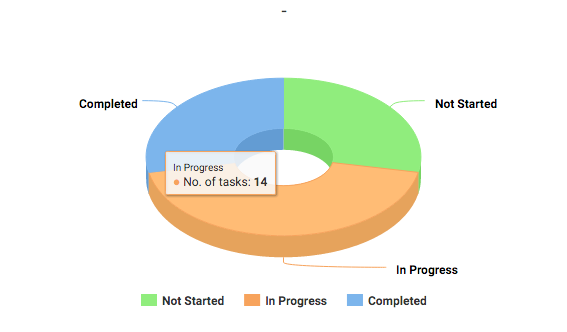 This KPI makes sure that no task has remained unassigned when the project is kicked off. 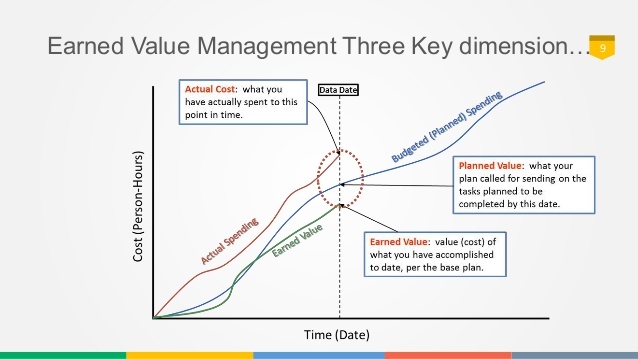 Earned value is considered as pretty powerful budgeting and tracking feature in project management. Though its terminology appears intimidating, but it is not really that complex. Earned Value (EV) analysis helps you get answers to pretty simple questions like, what is the amount of project work done so far? Have we spent right amount of money in the project so far? And importantly, will we deliver the project on time and budget. EV evaluate project performance objectively in terms of schedule, cost as per plan and actual progress. EV is also known as Budgeted Cost of Work Performed (BCWP). Essentially, it calculate amount of project work (task) completed at a given point in time (usually now). It is expressed in monetary terms. Say we have a 10 days task with budget of USD 10000. By the end of 4th day, the task is actually 30% progressed. Earned Value (EV) by 4th day is US $ 3000. For a project manager, getting an early warning indication is very crucial. 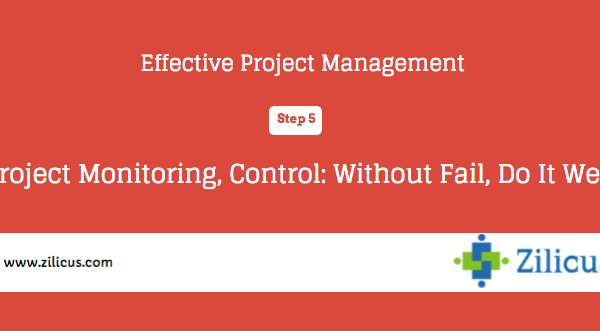 It enables project manager to address the problems before they start or as soon as they appear. Schedule Performance Index (SPI), is one of the key element of the Earned Value Management analysis. In essence, it clearly informs project manager how much ahead or behind a project is currently. Project financial KPIs are considered to be the most crucial apart from schedule/progress one, of course because if is about money, it can be about topline, it can be about bottomline as well. Companies, project managers have different ways to track financial performance of the project. Popular ones in project management domain are cost performance index (CPI), cost variance, project billing, margin, etc. One can track project financial performance using ZilicusPM. Earned value management is well known project performance evaluation technique. It evaluate project performance objectively in terms of schedule, cost as per plan and actual progress. One of the key elements of Earned Value management (EVM) is planned value of a project. It is also known as budgeted cost of work scheduled (BCWS). BCWS of a project is estimated cost of scheduled project activities – tasks along with overheads, as on a date. Remember, this budget is planned or scheduled activities (remaining) in the future and not actually performed ones or even those scheduled in the past date. Example given below will make it easier to understand the concept and calculations. Comparing planned value (PV) with actual cost of the project gives a sense of whether we are over-spending or progressing at a cost lesser than estimated. Though there is no special formula for calculating actual project cost, as one has to simply add all elements that have contributed towards completion of project activities. It is also called as Actual Cost of Work Performed (ACWP) in earned value management methodology. Earned Value (EV) is used pretty regularly by seasoned and experienced project managers. Earned value of a project shows how much value has a project earned till a given point in time. It is also termed as Budgeted Cost of Worked Performed (BCWP). It is the proportion of project budget that is equivalent of actual progress made i.e. project value earned. Project cost variance is the difference between actual cost of project and budgeted amount. It clearly tells us whether project manager responsible for a project is overshooting its allocated budget or it is progressed within budget. Project cost overrun is important KPIs which is tracked in almost all projects wherever project budget allocation processes is followed. Since it is a money matter, stakeholders would like to know how efficiently project is planned, being executed. Cost overrun expressed as a percentage of project budget indicate project cost/expenses that have not been correctly considered/assumed while making budgetary provisions. In pure mathematical or formula terms, it is a ratio of earned value (EV) over actual cost (AC). It is viewed as a measure of cost efficiency of project execution – whether allocated budget, resources etc are utilized effectively to earn desired value of the project. Business can operate and succeed only if certain margins are maintained. same is true for organization that are into project business. When a project is delivered if it is expected to maintain say 15% margin, that’s the Project KPI for every project manager to follow. Project resource utilization is very effective and helpful indicator to plan optimal staff assignment. One can optimize staff assignment in terms of cost, productivity or billing or delivery commitments. If your organization follows strict KPIs about resource utilization such as “no staff member can have less than 85% utilization in a project“. 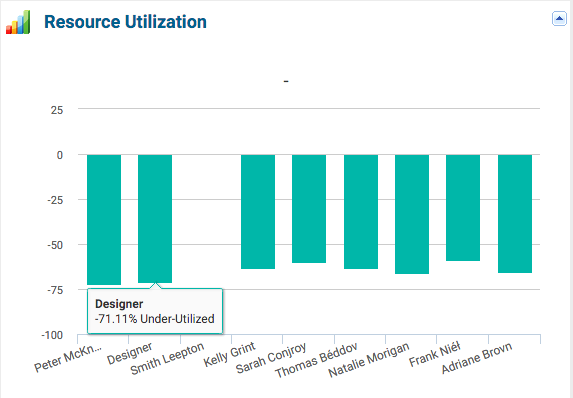 It means you will need a easier way to track utilization of every resource in a project and clearly see if anyone is overloaded/under-assigned compared to KPI. Track resource-wise workload/ assigned hours using report and easily see if there are staff members without optimal workload. Seasoned project managers will always keep a tab on risk register. 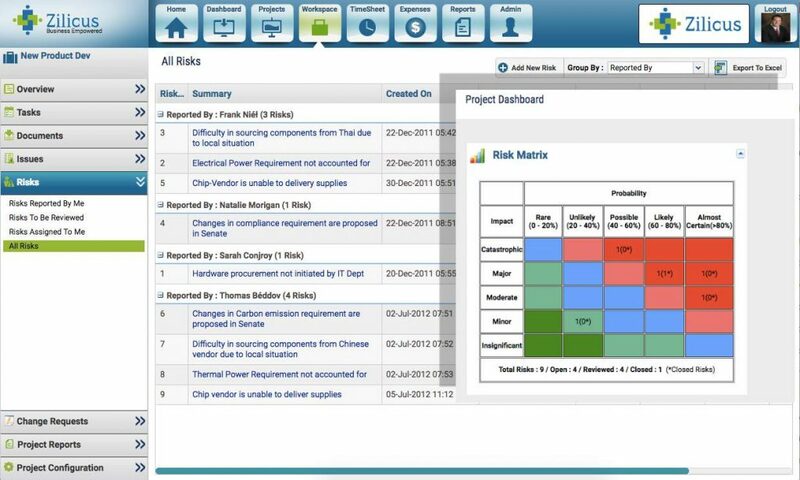 Knowing project risk profile of a project enables project manager to manoeuver project activities and mobile project resources. Tracking project risk KPIs is very important for various industries such as electronic manufacturing, engineering services, chemical processing and so on. These days, risk management has become integral part of project governance process. This means, project risk KPIs are necessary for project to be compliant with required standards and audits, etc. 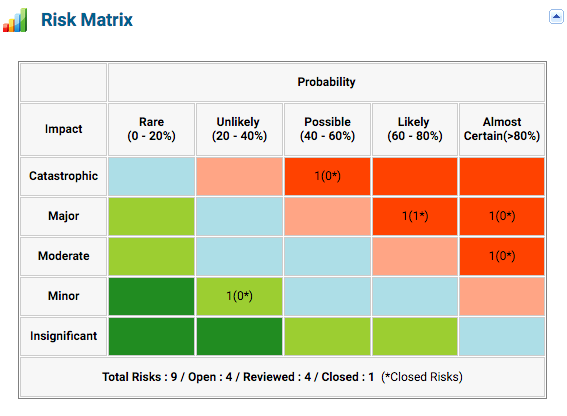 Risk heatmap or 5X5 risk matrix is a pretty known measure of assessing risk profile or risk performance of a project. Risk heatmap basically visualises project risks on a 5X5 matrix where rows and columns are represented by risk probability and risk impact. Depending on the number of risks in a given area, project manager or portfolio manager can quickly understand risk profile of a project. This is essentially a count of number of risks in your risk register. Let’s keep aside the quality of risks reported, and assuming a sound risk reporting process, it gives a good indication for a project manager or portfolio manager, right from the project planning phase, whether project risk profile is rewarding or concerning. In a project portfolio if there are risks which are yet to be reviewed by project manager, portfolio manager or PMO team can quickly understand that how risks are being managed in a given project or/whether project manager is unable having difficulty in managing a schedule. Similar to above KPI, if portfolio manager or PMO team wants to keep a tab on risk management being practiced in individual project, the percentage of reviewed risk can be a good indication how far project manager is managing risks. Again similar to above KPI, if portfolio manager or PMO team wants to keep a tab on risk management being practiced in individual project, the percentage of reviewed risk can be a good indication how far project manager is proactively managing risks. For a project manager or portfolio manager, if there are risks with catastrophic impact, one need to be highly aware and informed about risks with catastrophic impact. If a given project has many such risks, the project has its fate decided unless management navigates it judiciously and carefully. But even to know what is in store for us, managers need to know the count of risks with catastrophic impact. When a risk is evaluated with high probability, project manager, portfolio manager need to pay attention to almost certain kind of risks looming on the project. This KPI keeps managers aware of such high probability risks project may face. Project changes are inevitable part of doing “project business”. There would be hardly any project that goes exactly as planned without any changes. Change requests be right and wrong for project. The process to define right and wrong of change request is change management process. However unless there are right measures to evaluate benefits and impacts, one can not approve or reject change requests. Having project change request KPIs is the only right step in that direction. Portfolio manager when assessing a performance of the project and project manager, needs to know the number of changes rejected. In customer centric businesses, the impact of rejected change request can be gauged by number of changes rejected. In the next post, we will look at KPI for project portfolio managers. Is there any other KPIs you as a project manager track? Do let us know your opinion. 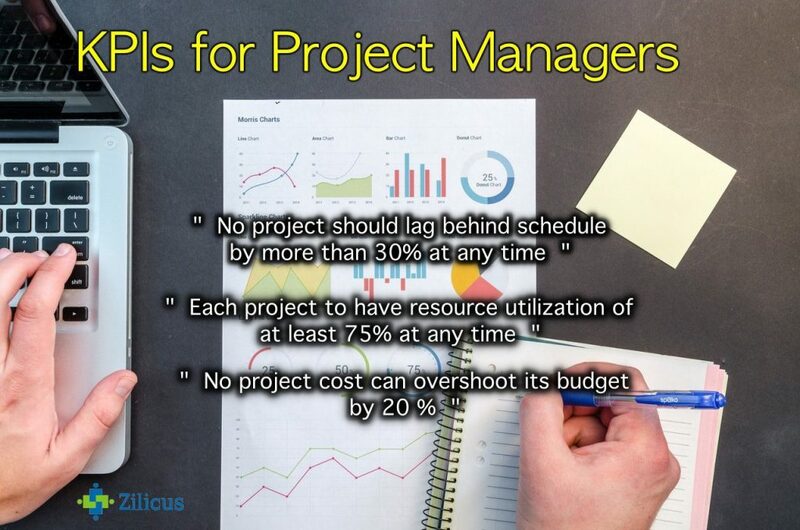 Zilicus offers All-In-One online project management software ZilicusPM that provides complete project management control for project and portfolio managers; at the same time makes it really simple for project team members to stay on top of things. If you have been managing projects with conventional spreadsheet/ MS Excel templates or emails, it is the right time to start using online project portfolio management software. ZilicusPM is great platform for better project collaboration.